I will be making Kalbi burgers again in a couple of days, and so I decided to make my own pickled peppers to grill for the burgers. 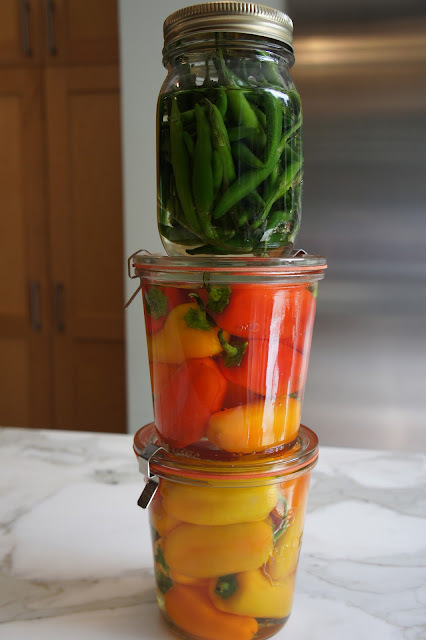 The pickling juice recipe below was enough for about 1 pound of sweet mini peppers and a little extra for which I decided to use for some thai chilies, about 2 cups, I already had in my refrigerator. Rinse and dry the peppers. Using a small knife, make a small lengthwise cut on opposite sides of each pepper. Place them into a glass jar and pour the pickling juice over top. Let sit on the counter for several hours and then refrigerate them. These should keep for several weeks in the refrigerator. Since I did not remove the skin from them, they will remain a bit firm and will not absorb as much of the pickling juice. But they should work out well for grilling and used as a condiment for the burgers.